Most years in mid-April, authorities working the international bridges along the southern border are paid overtime by local municipalities to help handle the large flows of traffic crisscrossing the border for Holy Week. Semana Santa, as it’s more commonly known, typically sees a 20 percent jump in traffic, leading to South Texas stores full of shoppers and restaurants packed with patrons. This year, though, there will be no overtime to pay for Semana Santa. There are not enough U.S. Customs and Border Protection officers for local cities to even pay. Hundreds of CBP officers have been reassigned from ports of entry to assist Border Patrol agents with attending to large groups of immigrants crossing into the country illegally. 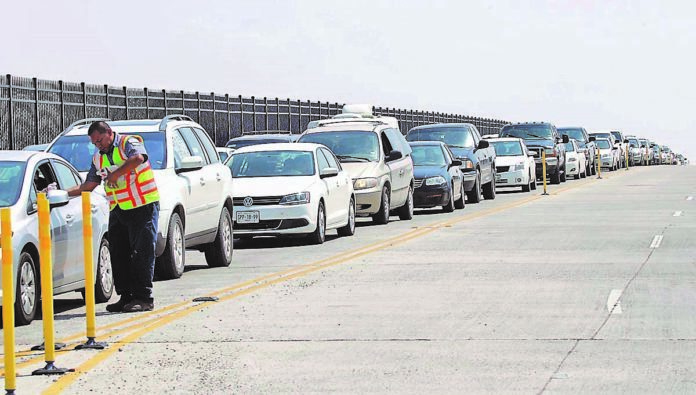 Normally around this time, McAllen issues thousands of dollars to help facilitate traffic on the two international bridges the city is in charge of — the Anzalduas International Bridge and the Hidalgo-Reynosa International Bridge. Other entities have often pitched in to help international bridges, too. But not this year. Villarreal isn’t alone. Others along the border have spoken up about the issues at the ports, as well as some in Congress. Pete Saenz, president of the Texas Border Coalition and mayor of Laredo, also wrote a letter to the recently appointed McAleenan. The Pharr-Reynosa International Bridge, meanwhile, is the only full-service cargo bridge in the area, and has already lost 60 CBP officers in recent weeks who have been reassigned to assist the Border Patrol. Fortunately, Bridge Director Luis Bazan said, none of those reassigned were agriculture inspectors. Pharr is the country’s largest produce port of entry, crossing an average of more than 14,000 produce trucks per month. The agriculture inspectors are busy. “None of the CBP ag specialists were deployed to deal with the immigration issue, so we’re good there,” Bazan said, hoping to pay the inspectors overtime. Saenz went add in his letter that any clogs at the international bridges could harm communities. U.S. Rep. Vicente Gonzalez, brought some positive news to those concerned about delays in a statement.